Who, What, Why: Why is it Team GB, not Team UK? How come British Olympic athletes compete as "Team GB" when this title excludes Northern Ireland? In the run-up to Rio 2016 it was the most-Googled question - why GB and not UK? After all, Great Britain comprises England, Scotland and Wales, whereas the UK is the United Kingdom of Great Britain and Northern Ireland. That's one of the home nations left out. Officially, the team is the "Great Britain and Northern Ireland Olympic Team". But since 1999, the The British Olympic Association (BOA) has used the brand "Team GB". Some Unionist politicians in Northern Ireland have complained about this. In 2009, Stormont's sport minister Gregory Campbell said the name "excludes, and indeed alienates, the people of Northern Ireland". 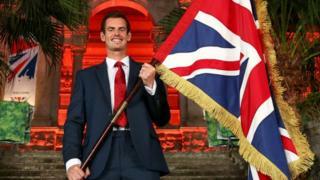 His successor also called for a change in branding to "Team UK". In a statement issued in July the BOA pointed out that it is the National Olympic Committee not just for Great Britain and Northern Ireland - but also for the Isle of Man, the Channel Islands and UK Overseas Territories such as the Falkland Islands and Gibraltar. Although the UK is responsible for their defence and external affairs, they are not part of the UK. The BOA says that "neither 'UK' nor 'GB' accurately describes the BOA's remit nor would they be representative of all the territories that fall under the BOA's jurisdiction". In other words, a Team UK title would exclude cyclist Mark Cavendish, who is Manx, and dressage rider Carl Hester, who is from Sark. Not everyone is satisfied by this reasoning. In 2012, the Scottish journalist Gerry Hassan wrote that even if "Team UK" would be inaccurate, "'Team GB' is even more inaccurate". In addition, the BOA notes that the International Olympic Committee has recognised the team as "GBR" since its inception in 1896. For this reason, the BOA says it makes most sense to use "GB" on its branding. Michael Hutchinson, a former racing cyclist who has represented Great Britain, Ireland and Northern Ireland at different tournaments, says most Northern Irish athletes in Rio "will be fairly laid back about it". In fact, of the 29 athletes from Northern Ireland in Rio, the vast majority - 21 - have chosen to represent Team Ireland, including Belfast-born boxer Paddy Barnes, who was the team's flag bearer at the opening ceremony. Only eight are representing Team GB. One thing is certain. "Team Great Britain, Northern Ireland, Isle of Man, Channel Islands and UK Overseas Territories" doesn't roll easily off the tongue.